Poco Loco the mouse may be a little nuts, but he’s got some great ideas, too. One morning, after using his Cuckoo Clock–Coffemaker and his Shower-Bed, Poco Loco is making breakfast (fluffy blueberry waffles) on his Waffle Iron–Weather Forecaster when he receives a forecast for mal tiempo (bad weather). The barnyard animals troop outside for a breakfast picnic despite Poco Loco’s repeated warnings. 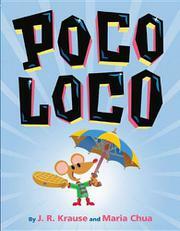 When a sudden gust of wind catches his trusty paraguas (umbrella) and sweeps Poco Loco into the air, his friends panic. Gallo (rooster) tries to help: “ ‘¡Ay, Poco Loco!’ / Gallo runs! / Gallo jumps! / Gallo grabs tight— / …and Gallo takes flight!” Gato, Cerdo and Vaca (cat, pig, and cow) all try to save their friends, until all are flying through the air hanging on to Poco Loco. When the rain comes and they all slip off, it’s a good thing Poco Loco is a genius! He saves the day with his helicóptero-paraguas! Husband-and-wife team Krause and Chua’s debut is an ebulliently silly bilingual barnyard tale with a glossary up front and plenty of prompts for Spanish words in the text and pictures: When Gato speaks, he meows, and Poco Loco’s umbrella is quite obvious when he tells everyone to get under his paraguas. The bright, stylized cartoon illustrations are just what one would expect from a designer who works on the Simpsons TV show.